Stanislav Kostov works in the fields of the contractual, commercial, corporate, labour, maritime, aviation and administrative law. He conducts procedural representation in cases before the Bulgarian courts and arbitrations. Stanislav Kostov is a specialist in the public procurement procedures and presents legal opinions and consultations in relation to the preparation of documentation or offers for the procedures stipulated in the Law on Public Procurement. He also participates in commissions under the Law on Public Procurements. His main activity is focused on the application of the EU Law. Stanislav Kostov prepares applications and court claims and conducts procedural representation before the Court of Justice of the European Union within the action for annulment, the action for failure to act, the action for damages and the other actions within the powers of the CJEU. Stanislav Kostov prepares complaints to the European Commission for breach of the application of the EU Law, presents consultations and prepares documents in relation to filing preliminary references to the CJEU. 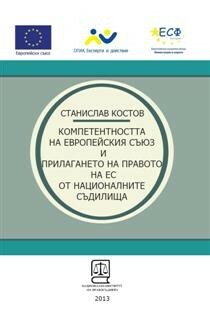 He conducts procedural representation before the Bulgarian courts in relation to the application of the EU Law and presents legal opinions about the right transposition of directives to the Bulgarian legislation. Stanislav Kostov is experienced in cases before Bulgarian courts related to the State liability for damages caused by breach of EU Law, as well as in cases focused on the financial corrections in the field of the operational programmes financed by the EU.